I think you can get some at supermarkets in USA, probably at bakery things section. It's called "desiccated coconut", ask for help from staff if you can't locate it. for those living in the states, most of the supermarkets have it under the 'baking' isle.... i found mine at albertson's.....good luck! 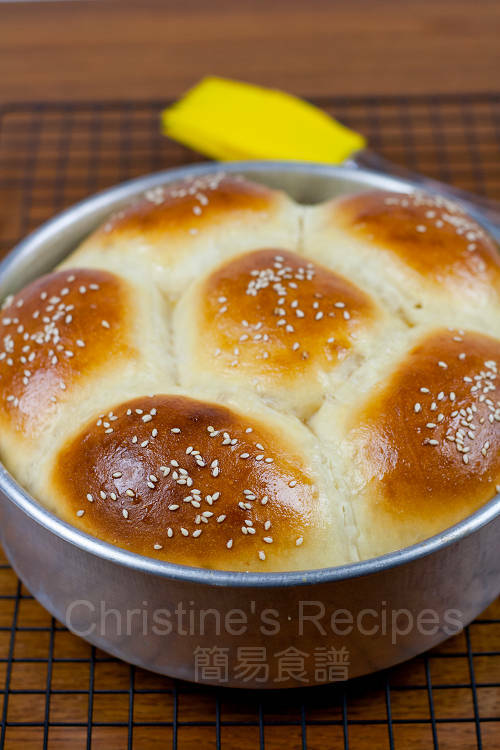 Do you use a bread machine for all your breads? Yes, I used my bread maker for making all the breads posted on this blog. Any reliable brands will do the job for you. Mine is a very basic one. I haven't tried to make any "man tou" with it, so can't tell. I want to make 雞尾包, 請問餡料跟這個食譜的椰蓉餡有無分別呢? I tried making some bread but they were not as dense and chewy as the ones I bought from the store. I tried to add some glutinous flour with the hope that the bread would turn out more chewy, but it didn't make too much of difference. 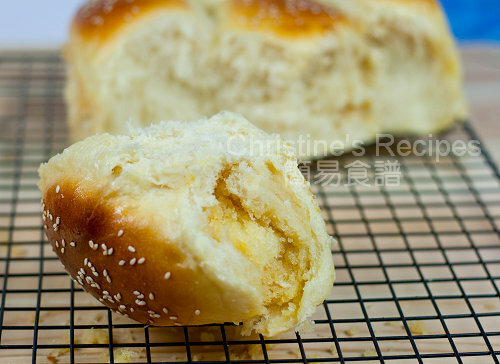 Do you have any idea as how I can make bread to be more dense and chewy? 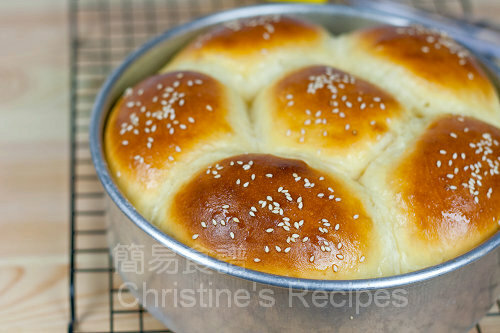 (I use bread machine to make them) Thanks, Christine. This bread made from this recipe is not chewy at all. It’s light and fluffy. What kind of “bread” are you looking for? Is it like mochi? In your recipe, 椰蓉餡材料calls for 15g egg. Do I measure after I beated it up? Can I just use one egg or is it too much? Thanks. I found that you put the measurements of the ingredients of the bread dough into 'cups/tablespoon/teaspoon'. Could you possibly transfer the measurements of 椰蓉餡材料 too? (because I don't have a digital balance) Thanks a lot!!! I only have active dry yeast at home. You said use 5-6g instant yeast, if I use active dry yeast, how many grams should I use equal to 5-6g instant yeast? Thanks. making this receipe right now. the filling - is 15 grams of each correct?? it seems like a very small amount. i just finished baking this. Need some guidance from you! My bread was brown in 22 mins, the crust was quite hard, not soft at all. Is this cos i didn't allow it to rise enough? Also, in your instructions, after putting in the filling, i roll from top to bottom, and close the ends. then your instructions say to roll it flat again, in the same direction or opposite direction? I must try it again. 1st time that i've used a breadmaker, couldn't determine how long it takes for it to rise. how long does it take your machine to let it double in size? The texture of the crust depends on the temperature and time of baking. I think your oven is too hot. Concerning wrapping filling, there's no right or wrong. As for proofing, you can judge by your eyes. If the dough double in size, that's ok. If you use active dry yeast, just use the same amount, 5-6g. But you have to activate it with warm water with sugar dissolved before mixing it with other ingredients. Are your recipes available in English? Would love to try them out but my Chinese isn't good enough to translate everything. Already translated it and posted here. My bread has over-rised as I was late for home...when it's baked it tastes a bit sour, is that still edible? I just tried your recipe yesterday, my 2 year old loved it! I wanted to ask you, if I could prepare it to step 3, and leave overnight? and do step 4 in the morning, so we can have freshly baked bread for breakfast? Many thanks for sharing, it has been a life saver finding your recipes after we have moved back to Sydney! You can do it like you said. 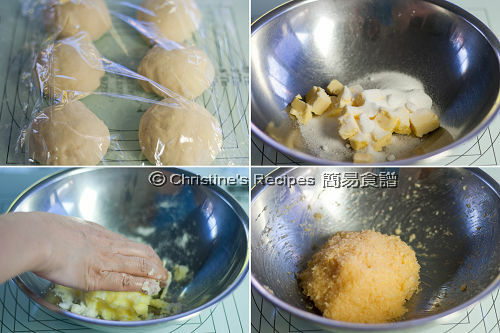 Keep the dough in an air-tight plastic bag. 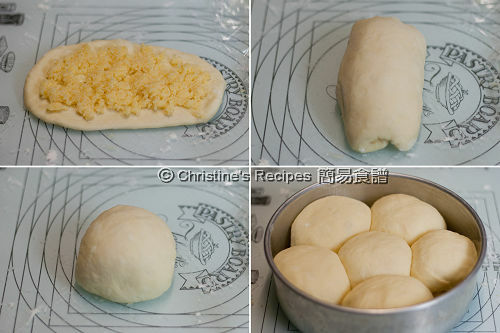 Remember that the dough will continue its proofing process in fridge, even though at a lower temperature. Make some more room for your dough in the bag. 我是你的FANS, 今次第一次留言. 我想問下如果椰蓉用唔晒, 可唔可以放入冰箱下次再用. 因為有雞旦成份, 所以有點擔心.